The Agenda includes a review of EAS activations in 2018, discussion of issues related to EAS weather activations and the project to subdivide Clark County. Broadcasters, including engineers, Chief Operators and Program Directors and emergency managers/Authorized Originators are encouraged to attend. Let me know if you have a specific issue you would like to add to the Agenda. This message is from Sage Alerting Systems regarding your Sage Digital ENDEC model 3644. It applies only to users in the United States. Sage has released a firmware update that you must install to permit your ENDEC to continue to receive EAS CAP alerts from FEMA. A FEMA signing certificate will expire at 11:45am June 24, 2018; if you do not install this update, you will not receive CAP messages from the IPAWS system after that date. This release also updates the SSL certificate roots that your ENDEC must have in order to download alert audio files from state or county alert originators. Please read the release notes at https://www.sagealertingsystems.com/release1-1/cr-rev4-release-notes.pdf. They will explain why this release is necessary, and what Sage will do in a subsequent release to reduce the number of this type of update in the future. The installation process is straightforward, as is described in the release notes. Installing this update will not change any of the settings on your ENDEC. If you have any questions regarding this update, please email us at support@sagealertingsystems.com or call 914-872-4069 and press 1 for support. If you get voice mail, please leave a message and we will call you back. On Friday, March 23 President Trump signed a $1.3 trillion appropriations bill that will mean some significant changes to the broadcasting community. The 2,232-page omnibus bill not only includes an additional $1 billion for spectrum repack on top of the already $1.75 billion already allocated, but also changes how broadcasters are treated in terms of access to funding, resources and critical areas in cases of disasters. To cut right down to the chase: this is good news for broadcasters all around. The countdown toward implementation of Blue Alerts has begun. EAS device manufacturers now have 12 months to make it possible for Blue Alerts — characterized by the three-character BLU code — to be delivered over the nation’s Emergency Alert System. It was in December that the Federal Communications Commission adopted a Report and Order that required EAS devices to have the capability to transmit the newly adopted Blue Alert code, which can be used by state and local authorities to notify the public of threats to law enforcement. What do stations need to do to prepare? Radio World spoke to two manufacturers of EAS equipment — Monroe Electronics, maker of Digital Alert Systems EAS products, and Sage Alerting Systems — to ask their opinions on what’s ahead for the broadcast industry when it comes to Blue Alerts. Regardless, the EAS system isn’t designed to be second guessed, he says. “One of the biggest questions I get from broadcasters is, ‘If this happens again, how do we confirm it?’ And my response is you can’t, and you shouldn’t,” says [Courtney] Harrington. Click HERE to read Nevada EAS chair, Adrienne Abbott’s, statement about the Hawaii False Alert. Hawaiians were thrown into a panic Saturday morning after an emergency alert was sent warning of a ballistic missile threat. But emergency officials took at least 20 minutes to relay it was a false alarm, with the governor’s office later clarifying it was caused when someone pushed the wrong button. The Emergency Alert System, or EAS, is a network of radio and television stations, cable television operators and IPTV services (EAS Participants) that is available 24/7/365 to local, state and federal officials to inform the public of a pending emergency, disaster or crises. This network is available at no charge because providers buy their own specialized EAS equipment, pay to maintain it and train their staff to understand the purpose and use of EAS. In addition, the broadcasters and other providers set aside program time in their weekly schedules for routine testing which ensures that the system is always ready for use. The Federal Communications Commission set up a national framework for EAS for National, Presidential warnings while allowing each state to build its own EAS plan tailored to local needs. The Nevada EAS Plan provides state and local government officials, as well as law enforcement and public safety officials, specific information on how to almost instantly access local radio, television and cable TV facilities to provide critical information, instructions and assistance to the public in a time of crisis. The Nevada EAS Plan also includes the Nevada AMBER Alert Plan which gives local law enforcement agencies nearly immediate access to radio and television stations, cable and IPTV services through EAS to get information to the public about abducted, endangered children. While many state and local government agencies have existing plans for dealing with the electronic media during an emergency, an EAS activation allows officials to instantly access every radio and television station, not just those with news staff, to provide critical information to the public. EAS operations were expanded in 2006 to include cell phones through the use of Wireless Emergency Alerts or WEA messages. In addition, the use of Common Alerting Protocol, or CAP programs, emergency officials can add EAS messages to their Social Media platforms and other Internet programs, giving emergency managers more ways to get life-saving information to the public. Broadcast signals don’t recognize geopolitical borders so the Nevada Emergency Alert System not only covers Nevada, but also the portion of California east of the Sierra Crest, and extreme northern Arizona. Because no single broadcast service covers the entire state, Nevada’s EAS is divided into three regions, as shown in Figure 1.
o The Western Nevada/Eastern California Operational Area includes northern Nevada and northeastern California. This area is shown in blue on the map. o The Southern Nevada/Inyo County California Operational Area serves southern Nevada, southeastern California and Mojave County, Arizona. This area is shown in pink on the map. o The Eastern Nevada Operation Area serves eastern Nevada. This area is shown in yellow on the map. o Some areas of both Nevada and California are completely isolated from outside broadcast signals, including satellite services and EAS providers in those communities operate independently. The FCC regulates the Emergency Alert System through rules established in CFR Title 47, Chapter 1, Subchapter A, Part 11. The FCC appoints each state’s chairperson who oversees EAS activities with the assistance of the State Emergency Communications Committee or SECC. Together they develop state and local EAS plans, as provided in the Part 11 rules. The chairperson selects SECC members from the organizations which have a role or interest in providing public warning and other EAS activities. The chairperson and the committee members serve on a volunteer basis with support from their State Broadcaster Association. The EAS State Chair in Nevada is Adrienne Abbott. Members of the State Emergency Communications Committee include Vice Chairs Steve Scott, Bill Croghan and Dan Mason. All three are original Committee members who have served since 1995. The President of the Nevada Broadcasters Association, Mary Beth Sewald, also serves on the SECC along with other broadcasters. The most frequent user of EAS is the National Weather Service which uses EAS to present critical weather information and warnings to the public. NWS is currently represented on the SECC by Todd Lericos, Meteorologist in Charge of the Las Vegas Weather Forecast Office or WFO; Daniel Berc, the Warning Coordination Meteorologist at the Las Vegas, WFO; Jon Mittelstadt, Meteorologist in Charge of the Reno WFO; Chris Smallcomb, Warning Coordination Meteorologist at the Reno WFO; Gregory Barnhart, Meteorologist in Charge of the Elko WFO; and Clair Ketchum, Lead Forecaster at the Elko WFO. State and local emergency officials who also serve on the EAS Committee include Kelli Baratti, Nevada Division of Emergency Management; Aaron Kenneston, Washoe County Emergency Manager; Arlene Chapman, Clark County Emergency Management; and Carolyn Levering, Las Vegas Emergency Management. Broadcasters and cable service representatives include Heng Choong, Cox Cable: Tracy Teagarden, CBS Radio; Phil Burger, KNPB; Ray Fodge, Beasley Broadcast Group; Danna O’Connor, KUNR; and Lori Gilbert, Elko Radio. HOW DO I GET A COPY OF THE EAS PLAN? A copy of the Nevada EAS Plan is available on this website. However, we urge broadcasters to contact SECC Chair Adrienne Abbott for a hard copy of the EAS plan and more information on EAS in Nevada. In addition, Adrienne routinely emails an EAS report including news, regulation changes and a list of recent tests and activations to EAS participants, emergency managers and others who have EAS obligations. WHO AM I SUPPOSED TO MONITOR FOR EAS COMPLIANCE? 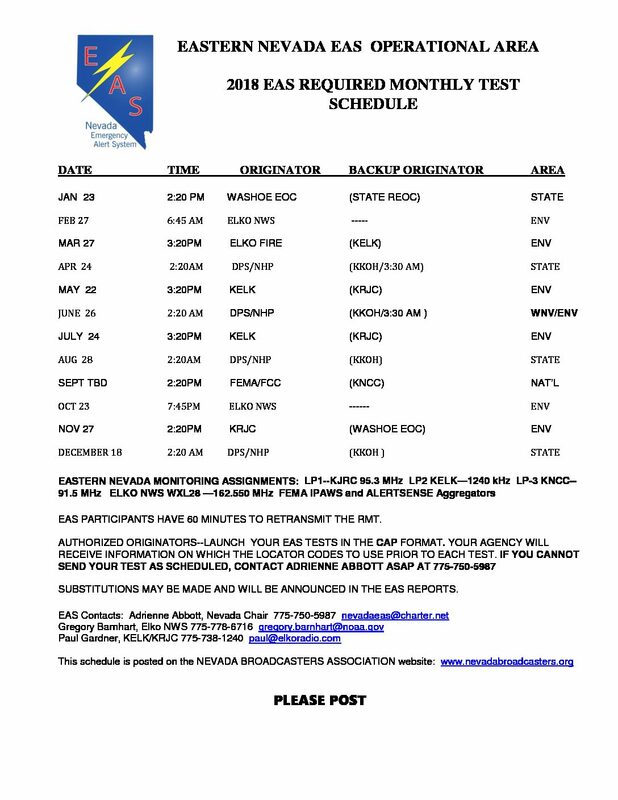 The Nevada EAS Mapbook provides a complete list of all EAS Participants and the specific stations which they are supposed to monitor. This Mapbook is an FCC-mandated document, per Part 11. It is available on this website. WHERE DO I GET MORE INFORMATION ON EAS?